Scottish Liberal Democrats - you can't trust them. This is the proof! FibDems - brought to you with the support of a "Senior Lib Dem Peer"
Danny Alexander, FibDem MP for Inverness, Nairn, Badenoch and Strathspey, opines on the news that the university for the Highlands and Islands will not be undermined even although it has suffered a serious setback because it will not be awarded its title next year. Old Porridge wonders if Danny's reluctance as an opposition MP to make hay of the situation may have something to do with who has responsibility for further education in Scotland. Step forward the man who thinks he can be First Minister. Regulars may remember Tavish's sanctimonious (and ultimately hypocritical) claim that they didn't play politics with road safety. AN EXECUTIVE minister has avoided a court appearance after police caught him speeding at more than 80mph. Lib Dem MSP George Lyon was spotted by cops thundering through Cairndow in Argyll more than 20mph over the limit. But instead of being dragged before a sheriff, the deputy finance minister has been given a £60 fine and three penalty points. Lyon's VW Passat was pulled over on September 23. Yesterday, he was unavailable for comment but a spokesman said: "He regrets his actions. 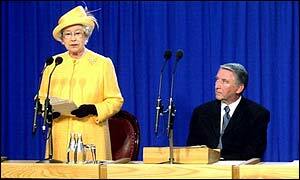 He previously held a clean licence." But the decision not to prosecute sparked anger. Isobel Bridie, of the Scottish Campaign against Irresponsible Drivers, said: "We would definitely have liked to see a court appearance and, if necessary, a driving ban for people who speed excessively in this way." FibDem Towers has to yet again ask why is George Lyon still a Minister? A question the "furious" Ming and Nicol Stephen should be asked. Or is being "petty and mean-spirited" a prerequisite for getting on in the Fibs? Maybe the Scottish Transport Minister should also be asked - a one Tavish Scott who likes to give the impression in elections that he cares about road safety. "At the side of..."? Pulled over again was he? Did they bear false witness? FibDem Towers did come across an article from last week which said that the "Moderator [of the Church of Scotland] will meet with local representatives including Jo Swinson MP, Des McNulty MP and Alan Reid MP". This "visit follows the Long Walk for Peace last month from Faslane to the Scottish Houses of Parliament together with the Archbishop of Glasgow, Dr Mario Conti". Old Porridge is concerned about what they may, or may not, tell a religious leader. He hopes it's not the twisted contortions of Euan Robson and they be honest and tell him the truth of their party leader's support for Trident. After all, and regardless of whether you support or oppose a nuclear deterrent, bearing false witness is a sin. "Yeah but, no but Father McDonald I totally agree with you that we should get rid of these evil weapons by keeping them like my leader says." Did you get that? A "crook's" £2.4 million. THE Scottish Liberal Democrats are refusing to say how much of their 2005 general election campaign was funded by a businessman jailed for perjury. Party bosses are declining to put a figure on the amount sent to Scotland as part of the £2.4 million donation provided by a company owned by criminal Michael Brown. The controversial donation to the UK LibDems may have to be handed back, after the high court described Brown’s firm as “fraudulent” in a breach of contract ruling this month. Forced repayment would be a disaster for the party in Scotland, blowing a hole in their Holyrood election plans. Having had a quick board meeting with others at FibDem Towers we wondered how Paul could take this forward. There is of course the £2.4 million question. Perhaps Paul would like to get some clarity on which of Waldorf or Statler was telling the facts and if any of this money found it's way into producing literature to fight an "entirely fraudulent campaign based on a wholly bogus prospectus" in Dunfermline? Then he might like to look into the seats they won in 2005. 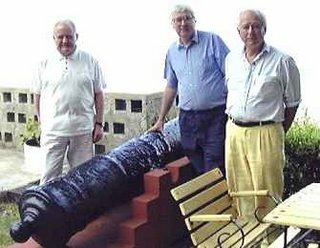 Old Porridge has been told by other board members that you couldn't get into your house at times for the amount of high quality FibDem newsletters delivered by those well known Liberal Democrat volunteers - the Royal Mail. Where did they get the dosh to pay for so much postage outside the period when expenses have to be declared? 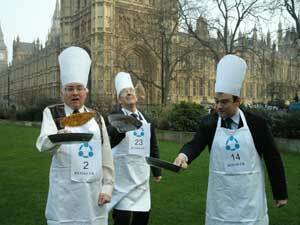 And if it was Mr Brown's filthy lucre do the Labour party have grounds for calling a re-run? We wish Paul well in his endeavours and are sure he will find lots more to tell Sunday Herald readers about the deceits the Fibs play on his readers. Just as we said, and as Iain Dale said, and as Guido said, and as Yellow Peril said, the Fibs just would not be able to avoid a reckoning over the £2.4 million question. Now it is reported that the "Electoral Commission could still seize £2.4m donated to the Liberal Democrats by a man later jailed for perjury, the watchdog has said". Doesn't really chime with their claim that "There is no connection between the Liberal Democrats and the offences to which Michael Brown has pleaded guilty and has been sentenced today". But it is the Fibs we are dealing with here. * N.B. Linked story is 17 June 2005. Photo is from 2nd Jul 2006. Does Ming approve? It get's worse for poor Bob Russell and his typically opportunistic sanctimony on the "black economy"
But Mr Russell's comments appeared to have backfired yesterday after opposition MPs pointed out that the term had been regularly used by many of his own colleagues. Last month, a motion at the Liberal Democrat's annual conference called for delegates to campaign against the 'black economy'. The party's Trade and Industry spokesman Ed Davey also uses the term on his personal website, while another senior Liberal Democrat MP Paul Holmes has previously campaigned against economic moves which "drive the most needy into the black economy." Other Liberal Democrats who have used the term include John Barrett MP, Chris Davies MEP and Liz Lynne MEP. But last night on Question Time Lord "Pad-me" Ashdown used the expression as well. Oh really Bobby? Maybe you should have told that to Fibdem MEP Liz Lynne who used that exact term ‘black economy’ in her motion at the Liberal Democrat conference. Squealer wasn’t there at 16:50 on September 20th when it was moved but it would have brought a snort of delight if he was. Squealer awaits in anticipation for this ‘sanctimonious twit’ to put a foot wrong again! 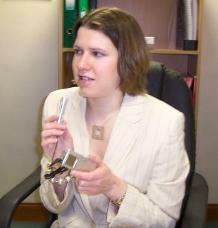 Jo Swinson isn't one to hide her piousness under a bushell. Criticising the Commons chiefs for keeping details of MPs' expenses secret she said "I just cannot understand why the authorities are not obeying this ruling. If the ruling is that they should be open and transparent, then I don't see the argument for not doing so." Maybe she would like to mention this to her own party's Lord Steel who wasn't so "open and transparent" on confidentiality when it came to the Holyrood Project. "...and my Lord Steel still owes me a fiver from 1968..."
Mr and Mrs Inquisitor are proud to announce the arrival of a bouncing blog entry when we heard that "Jo Swinson, LibDem spokeswoman on Scotland, has become one of the first MPs to make video clips of her appearances in parliament available on her website". Now, regular visitors to FibDem Towers will know we have always been more than a little eager to point out that when it comes to political statements, Ms Swinson displays the qualities of a supermodel. Namely a lack of intelligence. We await with baited breath to see if Jo will allow voters to view the utter humiliation she has experienced after her "appearances". The Libdems have been caught out once again on the Post Office. Hoping there was a mass wave of public amenesia in the mail, they prayed in vain people would forget that they actually want to privatise Post Offices. Clearly the package didn't get to Moray, as Angus Robertson delivered them both barrels in Scottish Questions. Angus Robertson: What recent discussions he has had with Ministers on the future of the post office network in Scotland. The Parliamentary Under-Secretary of State for Scotland (David Cairns): I meet regularly with ministerial colleagues to discuss a wide range of issues. Angus Robertson: I thank the Minister for that reply. I am sure that he will acknowledge the concerns across the country about the future of the Post Office, but is he aware of the growing dismay about those politicians who claim to support postal services while actually wanting to privatise them? That is, of course, the policy of the Liberal Democrats. David Cairns: I entirely agree with the point that the hon. Gentleman—whom I almost called my right hon. friend—makes. After nearly 6 years of claiming they had "abolished" tuition fees the Fibs are now opposing the meat of that policy - the graduate endowment which meant students paid fees for, er, tuition. The irony is that it was their policy as a means to play smoke and mirrors with the voters and students. Labour kept to their principles that tuition should be paid for. However you feel about it they said what they would do. 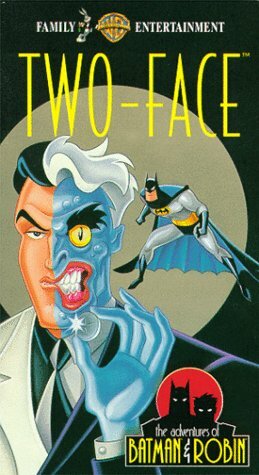 The Fibs played a two-faced game. However after 6 years and bills for tuition hitting the doorsteps of graduates it looks like students have realised that they've been sold a pup from the Fibs and are turning against them. One can almost feel the anger exuding towards the Fibs. So, dear readers, please tell all about this stark example of Fib boasts not being met by the reality. "There is no connection between the Liberal Democrats and the offences to which Michael Brown has pleaded guilty and has been sentenced today"
....the issue won't just go away - despite their attempts at hiding from it by failing to appear on the Politics Show. In fact FibDem members are at loggerheads with their bosses and want it paid back. Perhaps they have the sense to realise that when you are in possession of money that seems to have been acquired dishonestly that it is called "receiving stolen property". But why should the Big Fibbers change the habits of a political lifetime. AN MP has queried claims that scrapping tolls on the Forth Road Bridge would increase traffic by almost a quarter. Fife Liberal Democrat MP Willie Rennie has asked the Forth Estuary Transport Authority (FETA) to provide evidence to back its claim. As regular readers of FibDems will know Will-lie's position on tolls is not on firm ground considering it's his own party which has the responsibility in the Scottish Executive. However Porridge is confident that Will-lie will shamelessly ignore this lack of principle and honesty and pour out his leaflets to look like his party is in opposition and hope the local press don't pick up on it and tell their readers that their local MP has actually been spinning them a line. The Liberal Democrats' disability spokesman, Danny Alexander, said that it was "high time David Cameron stopped offering platitudes on disability issues, and started offering policy solutions". Yes, I know. We found it amusing ourselves. Pot, kettle and black and all that. Equality campaigners say proposals for a Scottish Commission for Human Rights (SCHR) will offer less protection to Scots than to people south of the Border. Porridge already has images on Lib Dem MSPs briefing disability groups with "platitudes" about their opposition whilst planning to vote to keep themselves in Mondeos, sorry, office. Yet more "amusing" postcard fun from those jovial Lib Dem types. Not content with poking fun at the President of the USA, while at the same time meeting his brother for a smiling photo opp, they have now come up with this little nugget on Tony Blair's plans to introduce greater checks on small children to ensure they are not conditioned toward anti-social behaviour. We confess to being at a loss at what they are trying to get at here. Are they suggesting that mothers in poor communities are so negligent that they smoke while pregnant? Are they implying that poor background individuals are incapable of talking in proper English? Are they suggesting that somehow the less advantaged communities lack the pride to clean their streets properly? Either way, we doubt very many people would find this funny given that it depicts a pair of women from a low socio-economic background smoking while pregnant, dressed like chavs, on a litter-strewn street. We're certain that it will go down a scream in urban communities when they see how the Lib Dems like to characterise them. But while we may not agree with their eventual conclusions, or indeed some of the things they say about Lib Dem "principles" (a bit like the Jersey Devil in that people believe it exists, but there's never been any proof) we cannot help but nod sagely as they slowly begin to see the light. And so, behold as another Lib Dem voter realises they're being conned. TRY as I may, I cannot do other than deplore the LibDem decision to rule out any form of a pact with the SNP in the certain event of no party winning a majority of votes in the Holyrood election. 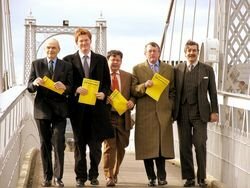 The greatest thing the LibDems have done in recent years was to vote against the Iraq war. It was a stand that won the admiration of many of us. Events have shown their principled and clearly thought-out position to be well founded. The war has exacerbated Iraq's problems rather than solved them. Now we have a situation in which more people are dying per month in Iraq than were killed in 9/11, torture is far more prevalent than in the days of Saddam and the country has spiralled into civil war. It was this stand that secured my vote at the General Election. The LibDems now, however, have apparently jettisoned principle and are only too willing to jump back into bed after the Holyrood elections with the party whose leader, Tony Blair, led Britain into that war on a tissue of lies. Any attempt by the LibDems to argue spuriously that Labour north and south of the border are two distinct entities is farcical. Scottish constituency Labour parties not only send MSPs to Holyrood, they also send MPs to Westminster. And Scottish Labour MPs were among those who most vociferously lampooned Charles Kennedy when he attempted to put the case for not going to war. Labour deserves to be punished north and south of the border but the LibDems are apparently not prepared to participate in its punishment. In fact, quite the reverse is true. It should be noted that the LibDems have not ruled out continuing in coalition with Labour. And Labour knows that only a big LibDem vote can cause it to retain control in Scotland. In short, yesterday's men and women of principle have, in effect, let it be known that they will be tomorrow's Labour fellow-travellers. Personally, I shall vote Nationalist in May and against independence in the event of a subsequent referendum. A B Robertson, Window Rock, Innellan. 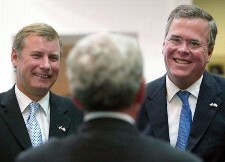 Those smiles and bon homie sit rather uncomfortably with this photo the Fibs use continually as they try to con people into thinking they took a principled stance on Iraq. It would seem our friend Bernie has a possible apprentice. Step forward Stephen Glenn of the West Lothian FibDems. As the BBC have reported this court case has nothing to do with his donation and the Electoral Commission have already ruled that the donation was permissible. Oh is that right Stephen? You're biggest ever donor being exposed as a crook has, er, nothing to do with your party? As someone points out later in the thread the Electoral Commission actually reserve "the right to say otherwise following the outcome of further legal proceedings". Obviously another example of fibbery being endemic in the FibDems. But Stephen is not any ordinary Fib. He publishes and promotes the Fibs West Lothian site. 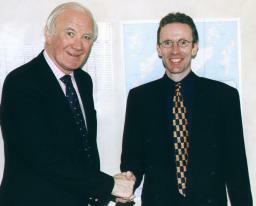 He was also their candidate in Linlithgow & Falkirk East. We seem sure that he will be popping up again for 2007 so feel it is a duty to warn the folk of West Lothian of the strong possibility of being misled in the months ahead. 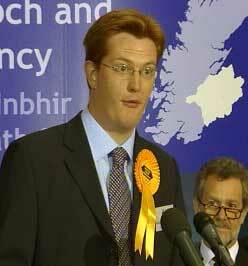 Who is the most ridiculous Lib Dem in Scotland?